At the end of this issue, we are promised “a double-sized epic 35 years in the making.” Well, 35 years ago, Jason Todd was about the time that Jason Todd joined the Batman cast o’ characters, so it makes me wonder (given the events here) if this isn’t the penultimate issue of Red Hood & the Outlaws. As explained previously, Bizarro’s intellect is regressing back to it’s child-like monosyllabic state. By now, he’s just about there. What that means for his teammates Artemis and Red Hood remains to be seen. Their super-secret invisible clubhouse floating in the sky is in danger of crashing, unless they can get a handle on its security system. Meanwhile, Jason is on the trail of the man responsible for his father’s eventual fate. It’s good to see new life breathed into stale characters like the Penguin, but rather than give DC Comics the credit, I think much of it should go to the writers and producers of the TV show Gotham, as well as actor Robin Lord Taylor. Together, they have created a much more lethal version of the character, rather than the caricature we remember as portrayed by Burgess Meredith. 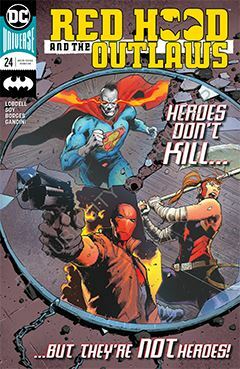 This issue also suggests a forthcoming clash between Red Hood and Batman. At least now we know why it hasn’t happened before. Clearly, writer Scott Lobdell was saving the event for when it mattered, giving it gravitas, rather than being a guest-star gimmick. It’s a potentially powerful issue. I say potentially because I’m too jaded to accept what I’ve read at face value. Somewhere there may be misdirection and misrepresentation, but I suspect the truth will have to wait for next issue.